A life of joy, grace, and blessing rooted in Jesus is every Christian’s birthright. And Pastor West’s four-part sermon series, The Grace of Giving, shares how you can rediscover the secret to living the abundant life that’s yours in Christ. Pas’ inspiring messages from God’s Word are a fresh reminder to do what you can do and trust God to do what only He can do. This must-have sermon series will encourage you and your loved ones to press on with trusting God, because He promises to be your Protector and Provider. 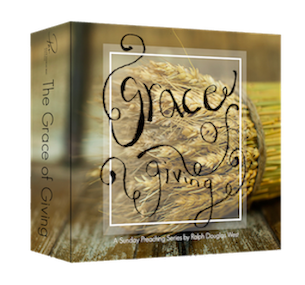 We’ll send you a copy of this four-part CD series today to say thanks for your gift to help proclaim the Gospel and build up the church. So get your copy when you give below to help lead, inspire, and empower others to trust God and live a life of spiritual maturity. Thank you for your generosity – and be encouraged!